Series G molded case circuit breakers provide increased performance in considerably less space than standard circuit breakers or comparable fusible devices. The "G" signifies global applications: Series G circuit breakers are marked with UL, CSA, CE, IEC and KEMA, KEUR listings. The EG frames are designed around spacesaving footprints. 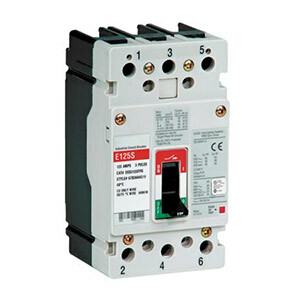 Series G circuit breakers meet applicable UL 489 and IEC 60947-2 standards. The G family includes five frame sizes in ratings from 15 to 100 amperes. Series G offers a choice of several interrupting capacities up to 18 kA at 415 and 480 Vac. Standard calibration is 40°C. The flexibility and outstanding performance characteristics of the circuit breakers are made possible by the best contact designs in circuit breaker history. Our technology creates a high-speed "blow-open" action using the electromechanical forces produced by high-level fault currents. These circuit breakers are operated by a toggle-type mechanism that is mechanically trip-free from the handle so that the contacts cannot be held closed against short circuit currents. Tripping due to overload or short circuits is clearly indicated by the position on the handle. This remarkably fast and dependable contact action is designed to enhance safety. The quality, dependability and reliability of every circuit breaker is ensured by a thorough program of in-plant testing. Two calibration tests are conducted on every pole of every circuit breaker to verify the trip mechanism, operating mechanism, continuity and accuracy. Circuit breakers are current limiting because of their high repulsion contact arrangement and use of state-of-the-art arc extinguishing technology. Omega offers one of the most complete lines of current limiting breakers in the industry. Circuit Breakers have a toggle handle operating mechanism, which also serves as a switching position indicator. The indicator shows the positions of: ON, OFF and TRIPPED. As an additional switching position indicator for EG- Frame circuit breakers, there are two windows on the right and on the left of the toggle handle, in which the switching state is indicated by means of the colors red, green and white corresponding to the ON, OFF and TRIPPED positions respectively.